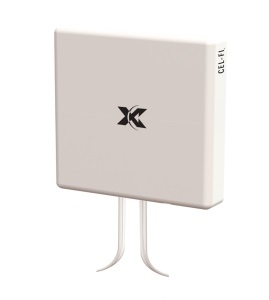 The Cel-Fi MIMO Panel Antenna is the only authorized indoor/outdoor antenna for Cel-Fi QUATRA. Cel-Fi AntennaBoost integrates the Cel-Fi MIMO Panel Antenna with the Cel-Fi WAVE Platform to provide the best donor signal in the industry. The antenna connects to any MIMO-enabled NU or CU with QMA (quick connect) cables. Nextivitys proprietary 8-position dial base enables the antenna to be rotated in 45-degree increments for best performance, managed with real-time data from the Cel-Fi WAVE Platform Antenna Position Test.